I was delighted to find out that there was a new cooking group for Dorie Greenspan's new cookbook, Around My French Table. I missed out on "Tuesdays with Dorie", and like many other fans out there, I really enjoyed Dorie's Baking: From My Home to Yours. To have a chance to cook through Dorie's latest one with fellow Dorie fans makes up for it. 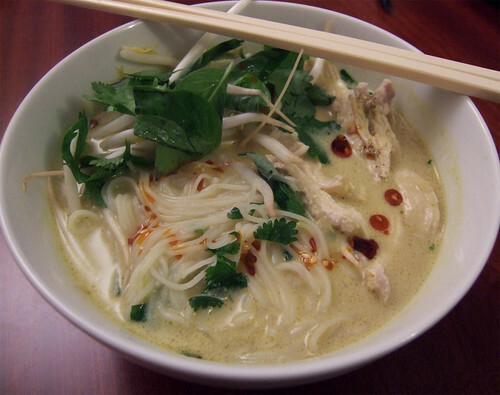 This is actually the third week into "French Fridays with Dorie", and this week, we were assigned Spicy Vietnamese Chicken Noodle Soup (pg 98). 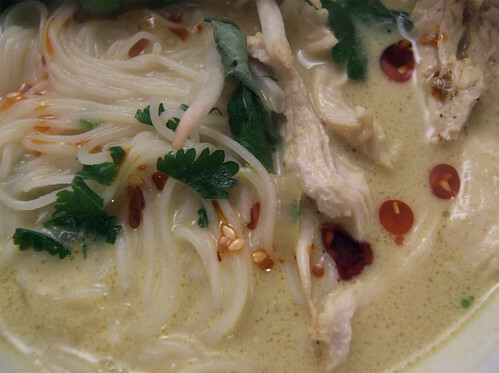 But wait a minute...what's a Vietnamese soup doing in a French cookbook? Vietnam was once a French colony (my aunt and uncle told me they had the best French bread outside of France), and as Dorie explains in the introduction to the recipe, many Vietnamese culinary influences have migrated to French kitchens. I followed Dorie's "bonne idée" and added curry to the soup, a perfect pairing with the coconut milk. This soup is so incredibly easy to throw together and will have you drooling from all the fragrance as you're standing over it at the stove. I only used 2 tablespoons of fish sauce, which was enough to season the soup. I added a bit more sugar and to help balance the saltiness, and lots of cilantro because, well, I'm a big fan of the herb. I served my version with rice noodles. If you're a fan of spicy, then don't be shy and throw in a few more dried chillies. And don't skip the chilli oil to serve! Make the soup ahead of time for a quick weeknight solution—all you'd have to do is reheat the soup, poach the chicken and cook the noodles. 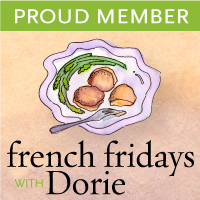 You too can be part of French Fridays with Dorie—just buy a copy of the book and sign up here! Posted by Bonita at 7:28 a.m.
Mary Ann October 15, 2010 at 9:30 a.m. I opted for the curry version too and thought it was wonderful. Lovely pictures! Mary October 15, 2010 at 11:17 a.m.
Great pictures. I can't wait to make this again. Tia October 15, 2010 at 2:18 p.m.
Elaine October 15, 2010 at 9:55 p.m. The curry just pops! It looks so beautiful! Mardi @eatlivetravelwrite October 16, 2010 at 6:46 a.m.
Bonita October 16, 2010 at 10:03 a.m. Thanks for all the lovely comments! Beautiful soup...so comforting for fall and winter nights! Mardi - This was an amazing recipe. Will definitely make again. The curry version is so full of flavour. Next time I'll also add the lemongrass as suggested by Dorie. ♥Sugar♥Plum♥Fairy♥ October 16, 2010 at 10:39 a.m.
Yeah i added only 2 tbh of the fish sauce dat was enough too!! Ur soup looks lovely and am sure the curry idea was good , i didn venture there!